Zircon comes in many colors such as yellow, orange, red, and blue. 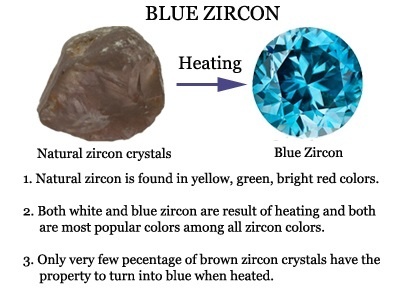 Blue color is the most popular from all of Zircon’s colors. This stone is not as famous as Tanzanite, Tourmaline, Moonstone and others. Some jewelers don’t even know about it but others who do know, know the real beauty of this stone. It is a favorite stone of collectors and they love the blue hue of this stone. More than 80% of Zircons which have been sold, are blue and the remaining 20% come in all colors. According to gemologist and big gemstones selling companies, this stone is going to be famous in upcoming years. I am a graduate gemologist and would like to share my thoughts over this stone; This stone is actually quite underestimated and not completely recognized in the market but now is seeing an increasing demand which shows that people are gradually getting to know the beauty of this fascinating gemstone. In the next few years, Blue Zircon is going to be a new history in the gemstone industry, just like Tanzanite was. In the middle ages, Zircon was used for good sleep, prosperity and positivity. If you would like to know how the name was discovered, Zircon comes from ‘zargun’ (a Persian word), which means ‘gold-colored’ but it comes in many colors. Sometimes Precious and Semi-Precious Gemstone buyers mistake Zircon and Cubic Zirconia as the same because of the similar names and the fact is that Cubic Zirconia is lab-grown imitation of different stones. Buy and Source Natural Cambodian Blue Zircon Gemstones from a Wholesale Supplier We have been selling Blue Zircon Gemstones at wholesale prices. Generally it is not easy to source Blue Zircon Gems but in our case it is not like this. We have been manufacturing it in our own factory. Properties, Quality and Color of Blue Zircon Gemstones -There are relatively few natural gemstones which come in blue color with good hardness and blue color brilliance. Sapphire, Tanzanite (the violet Blue), Aquamarine (Light Blue), and Blue Tourmaline are some stones which come in a blue color shade. Irradiated blue gemstones like Blue Topaz (Swiss and London) is also famous for its blue color, BUT without any doubt the most brilliant blue gemstone is Natural Blue Zircon. This stone comes with more refractive index than Sapphire, Tanzanite and other blue stones. It is found in a big range of colors, including rose, white, orange, blue etc. Most of the Blue Zircons are heat treated and clear with no inclusions but a few 100% Natural Zircons come with a smoky and cloudy appearance. This smokiness made this gemstone famous in the times of the Victorians. Blue Zircon is heated and that is acceptable in the market and there is no need of any disclosure because everyone knows it. The hardness of this stone is 7-7.5 on Mohs scale which attracts jewelers to make rings, pendants and bracelets using this stone. It can split white light into spectral (rainbow) colors and that unique property makes this stone more interesting. Basically it is produced by the heat treatment of Natural Brown Zircon but all Brown Zircon stones which are heated do not turn Blue, only those which have a “congenial” physical structure change into blue, this is the reason this stone is rare. We have been running our own heat treatment center in Thailand to produce this stone. Only good companies, who have experienced gemstones cutters, are manufacturing this stone because cutters can increases or decrease the market value of this stone. Mostly brilliant cut is famous to bring out the luster and firing, even though they modify brilliant cut in order to make the appearance better and that modified cut is called the ‘zircon cut’ but the labor cost of this cutting is high. Why are our selling prices competitive and at Wholesale for Blue Zircon? In the gemstones business, the main thing is sourcing and contacts. Cambodia is a big source of raw material of this stone and that is near to our country where we have our factory (Thailand). It becomes very easy for us to source raw material there and this way we reduce our manufacturing costs and ultimately our buyers take the advantage of this. Our buying is huge, we buy raw material in big volumes and this helps us keep buying prices low and it’s simple math of raw material and low production cost for us and then we are able to sell at very low prices to our customers. We have all small to big sizes in stock which start from 1 carat and go up to 10-12 carats per piece. Normally our starting prices for good quality is $50 per carat and goes high according to size, quality and the color. The color of every piece is magnificent and drives to top gem quality. We can just take a few hours to ship you a piece because we have many pieces in stock however we make it as ordered too if you need any special design, cut or cutting. Zircon is heavier than other semi precious stones and that is the reason it looks smaller in size when we are comparing the weight with other stones. Blue Zircon comes with good hardness however it should be kept with care. Most dealers keep this stone in soft paper (in India) and in other countries its kept in a gemstone box. If you are a collector, reseller or jewelry designer then please feel free to ask any question and we will send you detailed information with dimension, cut, carat, size and shape with a picture, in a short time and with a certificate. This way it will be easy for you to buy from us. Please contact us through mail or call to buy our Natural Blue Zircon. You can also visit our office in Bangkok, Thailand. Contact Us Here for more pictures, prices and quality information.